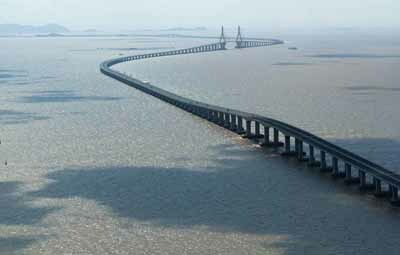 Donghai Bridge ( literally "East Sea Grand Bridge") was the longest cross-sea bridge in the world until Hangzhou Bay Bridge opened on 1 May 2008. It was completed on December 10, 2005. It has a total length of 32.5 kilometres (20.2 miles) and connects mainland Shanghai and the offshore Yangshan deep-water port in China.